A long standing ambition has been realised. We saved for an eternity, planned for ages and it was over in the blink of an eye. I have been right off the Patch. Inter-rail tickets got my wife and I from Paris to Budapest via Amsterdam, Berlin, Prague and Vienna. We had a fantastic/exhausting experience/adventure around some of Europe’s finest capital cities and I’m sure, in time, a few of the 1,000 pictures we took will dribble out on to my blog. It was a totally different experience for me, holidays are usually total relaxation on a Greek beach or a crazy wildlife photography trip to somewhere northern and cold. I loved it, my senses stimulated in a completely different way to usual. Museums, art, architecture and food replaced birds, bugs and mud. By going at the end of February and the first week or so of March I managed to be away at a fairly quiet time on the Patch. 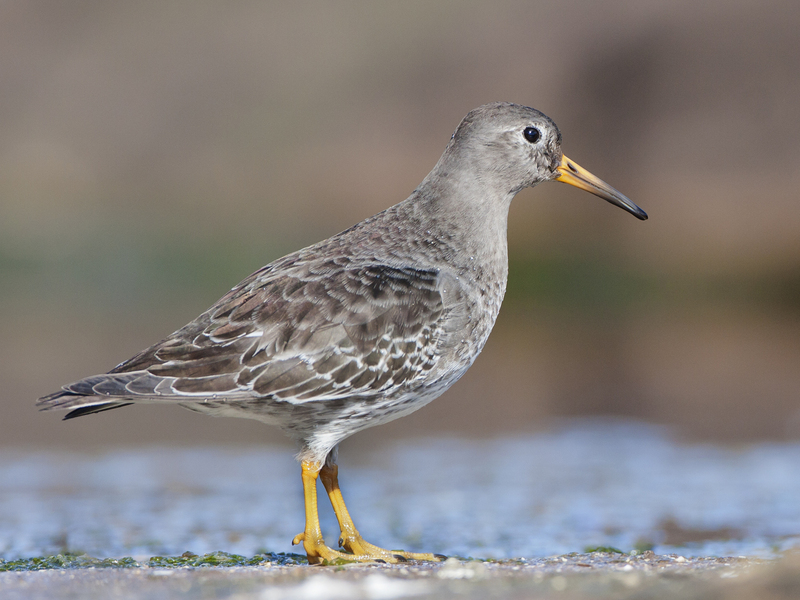 Some of the winter visitors were starting to drift away and the first migrants of spring were still a fair few miles away so I missed very little Patch action. I returned to grotty weather too, so I had fairly limited opportunities to get back in the Patch saddle after the grand tour of Europe. 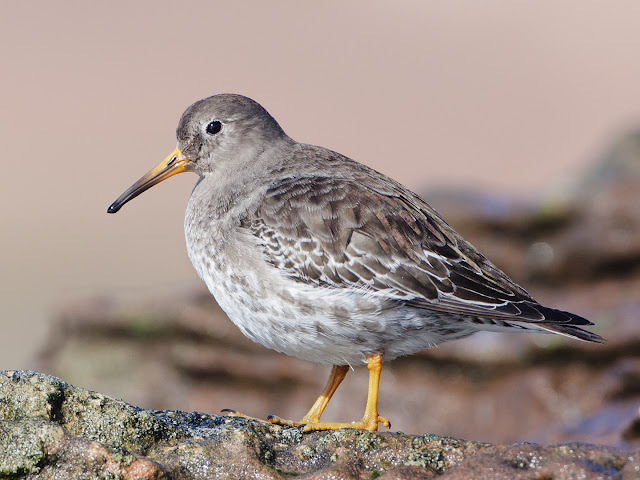 Eventually the sun reappeared, I just happened to be on Hilbre Island when it did and I was able to get some pictures of a soon to be Arctic-bound Purple Sandpiper – a Patch favourite of mine. The clock and my stomach were telling me it was lunch and time for a bite to eat. So I took a pasty and my camera to a sheltered sunny spot on the south end of the island. Above me was the clearest of blue skies, dazzling in its vibrancy, away to the west was a bank of clouds fluffed up into a cotton wool cliché. The sun felt warm on my face but was tempered by a cool northerly wind (a wind holding back Sand Martins, Wheatears and other migrants). I found a suitable perch on a low sandstone ridge overlooking glinting waves across to Point of Air and Talacre and tucked in. I was chomping through my rather dense lunch when my jaw juddered unpleasantly on a very elastic piece of pasty gristle, when spat out it ricocheted off my outstretched hand and fell to the ground where it bounced un-naturally high for a foodstuff advertised as edible. As I was cursing the well-known pasty producer, and questioning my lunchbox judgement in the shop that morning, I noticed a swift darting movement off to my right. A Purple Sandpiper (otherwise known as a Purple Sand or Purp) was mooching about the edges of a seaweedy rock pool. The letter of pasty complaint I was composing in my head was quickly forgotten as I exchanged food for camera. The sun was over my left shoulder and was illuminating the Purp perfectly, I had to have a go.... Disappointing pasty discarded I was ready to take my first Patch pictures for a while. It had been more than 3 weeks since I was last out but I was soon back in the swing of things, that old familiar click of the shutter ringing in my ears. I lay down to get a better angle as the Purp continued to dip the pool for its lunch. 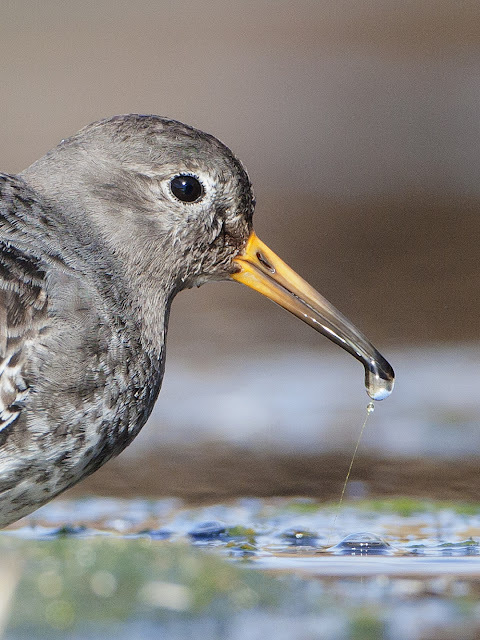 I had walked past its pool a few minutes ago and I saw very little in there but the Purp seemed to be finding plenty of morsels to make a meal. The odd meaty treat disappeared down its bill but I also saw it taking a bit of green algae from the edge of the rockpool. 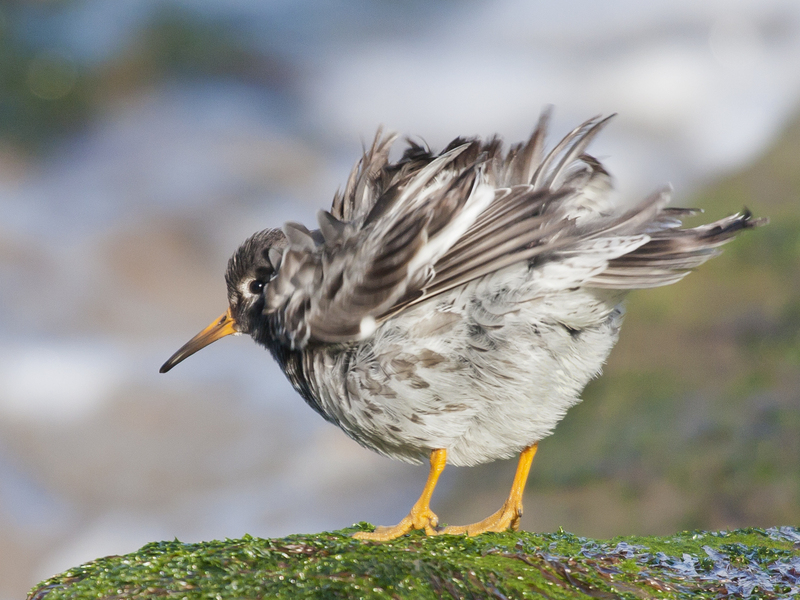 I have seen this before in small sandpipers, most recently in Norway when I saw Knots scraping seaweed from rocks. This was just prior to them making a mammoth migration flight and I’m wondering if this vegetation contains something that helps with this flight. 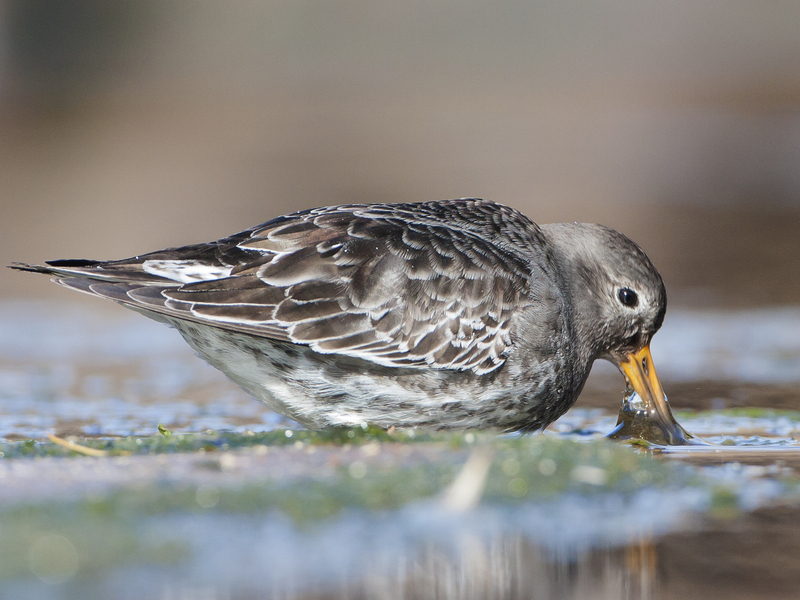 Perhaps their usual shellfish prey is in short supply after a winter of heavy grazing by Hilbre’s waders. Hmmm.... a little research needed methinks! 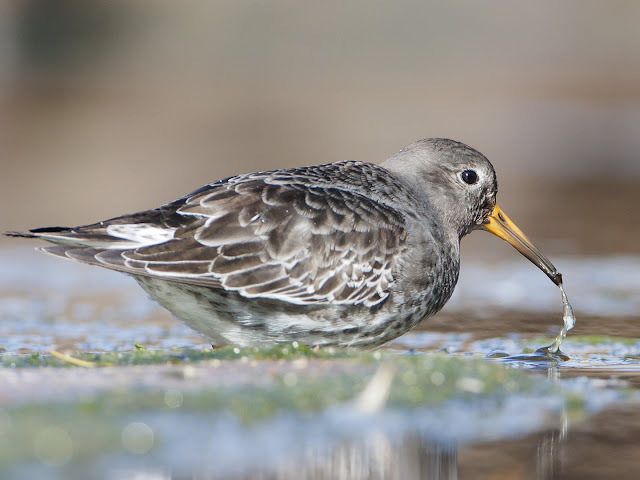 After lying down for the low angle I started to wriggle across the rocks to get a little closer and to get a better composition so I can record these great little birds before they head north for the Arctic summer. As I fired off a few shots I became aware of where I was lying. The sandstone was loose and grains came away as I moved. Bits got stuck under my fingernails and in my clothes, I could “feel” the Patch again. I detected an acrid ammonia-ish whiff and turning my head to the right I noticed that the gulls, roosting here for a while earlier, had left a few droppings that were right next to my wind and sun-reddened face. While the pooh may have been freshly deposited it smelled anything but fresh. Even though it is not exactly pleasant I could “smell” the Patch again. The Purple Sandpiper was still busily feeding and its bill made a creaky spattering sound as it wandered through the pool – I could “hear” the Patch again. 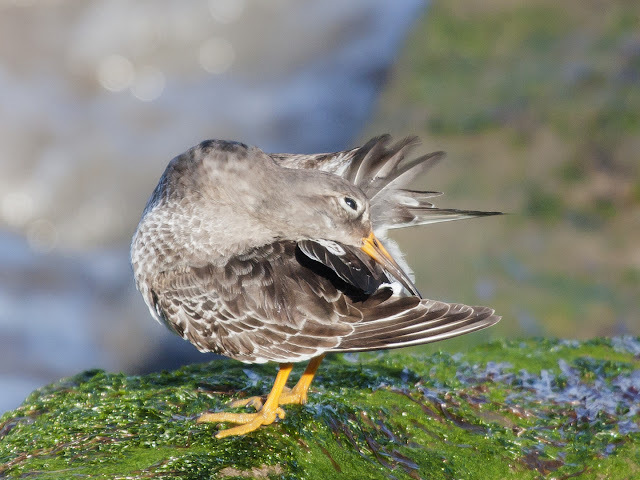 Once it had finished its lunch it strutted over to the waters edge for an after dinner preen. For a while I just watched the Purp as it attended to each primary feather in turn. I wondered if it was thinking about the journey north it was about to make. Is it nervous? Excited? Not thinking about it at all? It must know it has to prepare... I thought of the feelings I had before my recent epic trek across a continent. The plans I made, the expectations I had, the excitement and apprehension. The feeling upon locking the door on departure and opening it upon our return. I was looking at and thinking about the Patch again. The Purp shakes itself down and flies off towards the north end of the island. 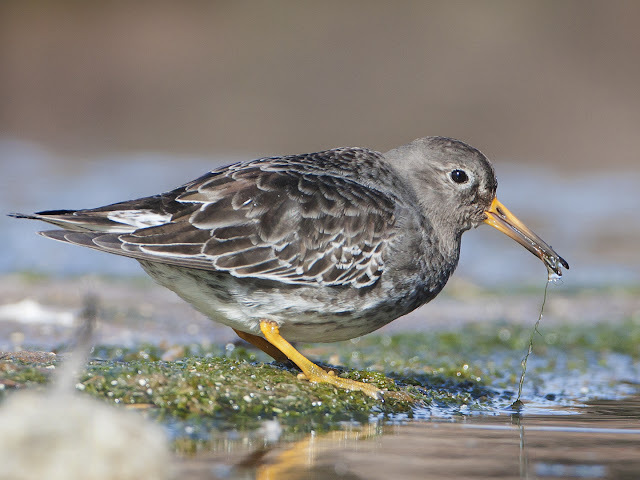 So after 3 weeks away just half an hour with a Purple Sand reconnected me and my senses with my natural habitat, the muddy banks of the Dee, the Patch.